The narrator explains the plot of the film, that’s right it needs explaining, this isn’t the plot from the game. Apparently when the meteor that killed the dinosaurs hit Earth (in Brooklyn by some freak chance) it didn’t actually kill them, it sent them to a parallel world where they evolved; this people ain’t the Mushroom Kingdom we remember on the NES. 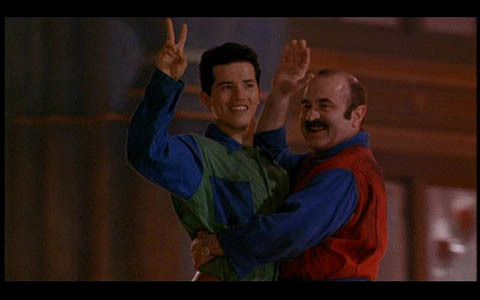 The Mushroom Kingdom of the film is a post apocalyptic cyber-punk city, where everyone is dressed in leather and spikes like a line waiting to get into a fetish club. Also for some unexplained reason everyone there is a tool, genuinely this makes no sense, they’re down on their luck they’re oppressed but there is no true logic to why everyone is murdering each other. Anyway back to the plot, this alternative dimension has come to be and with that we come back to somewhere almost familiar. Daisy (not peach) is taken from the “real world” where she was abandoned as a child, all that was left at the church with the egg she hatched from (this wasn’t explained) was a rock on a necklace, you later find out that this rock is used to teleport from one dimension to the other, though a lot of characters seem to manage just fine without it. Kooper wants this rock to smush the two worlds together and….well I’m not sure why, I don’t think it was honestly explained, I think he’s just greedy. That’s enough plot, actually it isn’t, but it’s pretty much all we, the audience, are given. This film had three writers and two directors, everyone should know that this is not a healthy number to produce a good film. These people involved have all taken their licks over the years for being involved but individually there was some good talent behind this. Ed Solomon previously wrote both Bill & Ted films, Rocky Morton and Annabel Jankel were the co-creators of Max-Headroom. Together though this pile of tripe was produced. The film isn’t all bad, there are one or two genuinely laugh out loud moments but the concept of calling it a Mario film is backwards. Toad is now a street busker turned into a dinosaur and Yoshi isn’t cute now, he’s a veloceraptor! The Mario Brother’s surname is apparently Mario, that’s right the main characters are called Luigi Mario and Mario Mario! The Bob-ombs wear Rebok trainers, the castle they need to break into is now an office block, Iggy and Spike are cousins with sub-intelligence. Nothing in this film makes sense. The lowest of the low however isn’t the directing or writing or even acting, it’s the soundtrack. This soundtrack contains odd choices like Marky Mark (Mark Wahlberg) and Megadeth, not bad tracks for their times, but the score for the film is so mismatched. The escape from prison scene has chase music that would have felt out of place in Home Alone or Laurel and Hardy; it’s overtlycomical where as just putting something dramatic “might” have made certain scenes exciting or at the very least mildly interesting.